Frederick Levy Castle was born in London, England, in 1830. 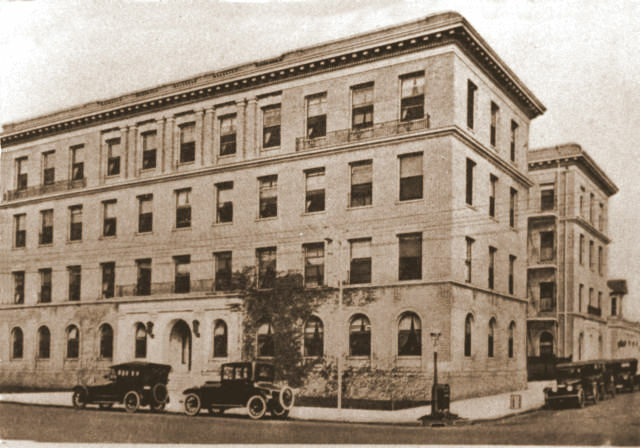 As a young man, Castle moved to Montreal, Canada, where he clerked for his uncles, the Benjamin Bros.,who conducted a large dry goods firm in that city. In 1849, the discovery of gold lured Frederick Castle to San Francisco, where he arrived, after a hard journey, in 1850. With his two brothers, Michael and Goodman, he started the wholesale grocery firm of Castle Bros. with a capital investment of $6,000 – his brothers savings. Their business prospered until the San Francisco Fire of 1854. There was no insurance for the lost merchandise. The only items not destroyed were 200 cases of Swedish safety matches – now in very great demand – which brought the brothers $100 per case for a total of $20,000, which more than covered their loss. Castle Bros. recovered and prospered until 1895. 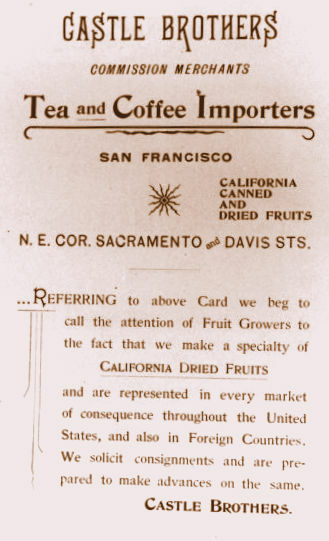 At this point, “Fred” Castle and his sons became packers and exporters of California dried fruits, nuts, and raisins, retaining the name of Castle Bros.
Frederick Levy Castle served as vice-president of the San Francisco Chamber of Commerce for a number of years. He was also an active member of the Traffic Association of California. “Fred” Castle was among the founders of Congregation Emanu-El. Frederick Levy Castle served as president of the Union Club and was a member of the Bohemian Club. Frederick Castle married Miss Charlotte Levy of Bristol, England, in 1854. They had nine children. Three sons, Walter, Albert and Arthur, were partners in the family’s dried fruit business. 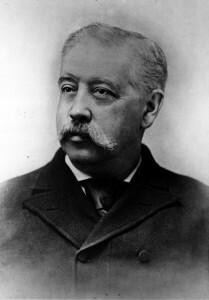 Frederick Levy Castle died in 1893. Martin A. Meyer, The Jews of San Francisco (San Francisco: Emanu-El, 1906). Fred Rosenbaum, Visions of Reform,: Congregation Emanu-El and the Jews of San Francisco, 1849-1999 (Berkeley, CA: Judah L. Magnus Museum, 2000). David Epstein is curator of this Frederick Levy Castle exhibit. Adolph A. Son and the Spitz Brothers: Pioneer Jewish Tobacco Merchants of San Francisco.